The words ‘premiere’ and ‘opening gala’ have an undeniable air of old-school Hollywood glamour about them, conjuring up red carpets, black ties, glittering gowns, paparazzi flashbulbs and spotlights strafing the sky above Hollywood Boulevard. It’s incredibly fitting then that the opening gala of the Glasgow Film Festival 2016 is the UK premiere of Hail Caesar, a tongue-in-cheek tribute to Tinsel Town’s glitzy golden age, starring modern day matinee idols George Clooney, Channing Tatum and Scarlett Johansson. Appropriately for a film fest opener, Hail, Caesar! 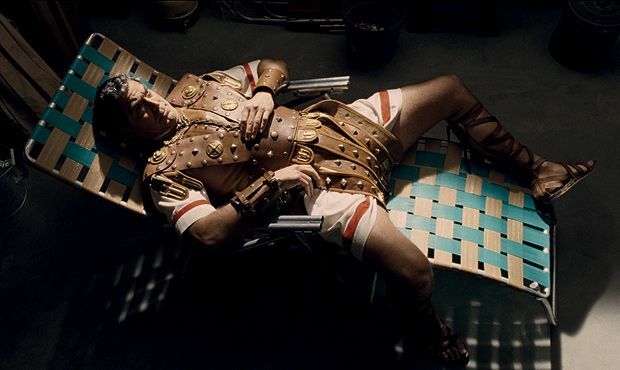 is a movie that’s in love with movies – which is just what you’d expect from writing-directing team Joel and Ethan Coen, a duo whose love of cinema inhabits every story they shoot. Here are a just handful of examples from their filmophiliac back catalogue – for optimum results, we recommend scheduling a double-bill and settling down with a jumbo bucket of popcorn. Set in Prohibition-era USA, Miller’s Crossing is of a piece with the noir books and movies of the 1940s – indeed, certain story beats and character names in Miller’s Crossing are lifted straight from Dashiell Hammett’s celebrated crime novel The Glass Key. However, we reckon the plot – about a taciturn gangland hustler (Gabriel Byrne) who finds himself working for rival mob bosses – also tips a wink to Sergio Leone’s A Fistful of Dollars (itself a Westernised remake of Akira Kurosawa’s Yojimbo), in which an unknown loner plays two warring crime families off against each other. In a (reluctant) interview with Indiewire, Joel Coen stated that the structure of The Big Lebowski consciously mimics that of a Raymond Chandler noir. ‘We wanted to do a Chandler kind of story – how it moves episodically, and deals with the characters trying to unravel a mystery, as well as having a hopelessly complex plot that's ultimately unimportant.’ Lebowskiites looking for a cinematic reference point should check out Robert Altman’s Chandler adap The Long Goodbye: starring Elliot Gould as Philip Marlowe (the hard-boiled detective made famous by Humphrey Bogart), the movie’s 1970s setting, Californian backdrop and druggy subplot will provide familiar touchstones for followers of The Dude, His Dudeness or El Duderino if you’re not into the whole brevity thing. Preston Sturges’ Sullivan’s Travels – namechecked above as an influence on The Hudsucker Proxy – also had a part to play in the genesis of the Coens’ masterful Depression-set quasi-musical: O Brother, Where Art Thou? was originally the title given to Sturges’ film-within-the-film. For our money though, Joel and Ethan’s Deep South riff on Homer’s Odyssey is best paired with the evergreen Paul Newman classic Cool Hand Luke – it doesn’t exactly share a time frame with O Brother (being set in the early 1950s as opposed to the 30s), but Luke’s chain-gang milieu, fugitives-on-the-lam plot and sinister, shades-sporting uber-villain still stand as significant links between the two. Ok, so this pairing’s a bit more obvious, but if nothing else it serves to underline just how much the Coens, with all their love of classic cinema, have held back from doing straight remakes – there’s only this and their unfairly reviled take on Ealing comedy The Ladykillers in the canon. In fact, they prefer to distance their True Grit from the 1969 John Wayne flick entirely, instead pitching it as a re-imagining of Charles Portis’ original 1968 novel. Still, even if the two films didn’t share the same source material, Wayne’s shadow inevitably looms large over any entry in the Western genre, especially one that explores the macho cowboy persona. It’s worth watching both films in quick succession to see the subtle (and not so subtle) variations between Wayne and Jeff Bridges’ versions of hard-drinking US Marshall Rooster Cogburn, not to mention Kim Darby and Hailee Steinfeld’s differing takes on tenacious teenager Mattie Ross. Released only six years prior, I’m Not There isn’t so much a cinematic forebear as a complementary perspective on an overlapping topic – namely, one Robert Zimmerman and the New York folk scene that spawned him. The Coens’ highly-lauded character study of a fictional Greenwich Village also-ran only briefly depicts Bob Dylan’s game-changing emergence on the scene, making it a nice counterpoint to Todd Haynes’ 2007 biopic which contains too much Dylan for one actor (Cate Blanchett, Christian Bale and Heath Ledger are among the six stars tasked with playing him). Fun fact: both Llewyn Davis (Oscar Isaac) and idiosyncratic backing singer Al Cody (Adam Driver) have gone on to greater (or at least bigger) things since working with the Coens, currently battling their way through space in Star Wars: The Force Awakens. Hail, Caesar!, Glasgow Film Theatre, Wed 17 Feb.